On Sunday 1 June 2014 @ 6 PM, is the second SharePoint Consultation, this time it will be recorded. To join, send me your email or just write your email on a comment on this post & I will send you an invitation. Save the Date & the link: https://plus.google.com/events/cmscptc14f93h3o2lnma3r32or4 as we will use Google Hangout. Note: please try to run Google hangout before the discussion starts as it asks you to download a plug in so we don’t waste time waiting. 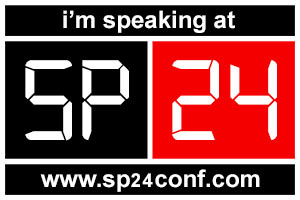 Heads Up – All SP24 Sessions Are Now On-Demand! Before you read the mail; BIG THANK YOU to SP24 TEAM for the effort done & for volunteering your time to make SP24 succeed & it was big success! As this will be one of our last communications for a while, we wanted to take this opportunity to say a massive thank you to all of the Speakers, Anchors, Sponsors, helpers, Fpweb.net (for hosting) and to all 7500 Attendees! Without you the whole event wouldn’t have been possible. You will have probably noticed that as you attended various sessions in the conference, you automatically received slides and code samples shared by the speakers. For convenience, these resources are not only available in each Session Room, but are also consolidated centrally in your ‘My SP24 Resources’ page. As you attend more sessions on-demand, this list will automatically grow with related resources. Please note: we don’t have all of the speaker slides yet but are working on it (hint, hint Speakers ;)). How to watch the On-Demand Sessions? Over the next few days we will be tidying up the site to put it into “On-Demand Mode”, but for now all you need to do is log-in and go to the ‘Session Planner’. Once there, click on any session that you want to watch and it will automatically start playing. Couldn’t be easier! The short answer – we really hope so! Putting this event together was a lot of fun and it was amazing to connect so many SharePoint enthusiasts with so many world famous SharePoint experts. It was even more fun building it all on top of SharePoint 2013 Foundation! Jon Manderville who will register your interest and give you more information as it becomes available. On that note, it’s good bye from all of us on the SP24 Team and we hope you enjoy the on-demand sessions. I decided to make a public Consultation call for 30 min on Sundays & once per week, it can be 1 to 1 or many to 1 [I am the one J], I didn’t say what hour but we can chat 1 day in advance to arrange accordingly, I am just trying to be flexible. This SharePoint Consultation call is basically to answer any type of SharePoint questions… yes any. I am not going to write for you a piece of code, or control your machine over remote desktop to solve a configuration issue… because this needs time & it’s only 30min. 2. Select the sessions you want to see using the “Session Planner”. Most important of all, you wanted to see the sessions again!! Unless you are super-human, it’s very unlikely that you got to see all 100 + sessions the first time around. So we have swapped the agenda and shifted the start time to give you another bite at the cherry (see the links below, log on and get registering for those sessions you want to see!). We also wanted to improve a few things, like removing trailers and making sure the ads didn’t stop you getting to a session you wanted quickly. We never got time to share all of the documents and slides the first time around, so we want fix that this time around (where possible). From a work perspective only J for my SharePointers fans, you have the right to know where am I, cuz during SharePoint Saturdays I had lots of fans and people attending and following me.. you don’t need to worry about that.. I am still around and will keep supporting you. I resigned from Etisalat Dubai & now working in Vodafone Egypt. First, I moved from Infusion to Etisalat Dubai.. but I am not fan of working in a comfort environment & that was Etisalat.. yes I am not that person that made me feel I am over qualified to Etisalat environment, it’s not bad environment no definitely I will not say this but it’s just so comfort! That I see myself won’t gain much experience if not losing!! I really needed a big but huge SharePoint environment to fulfill my passion, this huge move is because I am following my passion towards my work & I don’t see anything better than following my passion which means I love what I do but its v important to do it in the right place. I changed my career path from Senior Developer to Senior Administrator, it’s time to stop writing code, yup enough J 7 years of coding, either to go to a Managerial path or a more technical path like Senior Administrator in Vodafone International Services in Second line of Service Operational Support for the second world wide huge SharePoint environment. “I was surprised when my boss in Vodafone, told me, hey I am your co-worker, don’t take it as a boss, we both have to prove ourselves at the end.” it was a rare sentence in Egypt to hear but it was coming from deep inside, from that moment, I knew I was sure I am in the right environment! Why not return to Dubai but not now at all!! I am enjoying my new work environment & want to explore every piece there, the passion is what not stopping me, not to mention my home is not near at all to Vodafone, but luckily they provide transportation, which you may think what a waste of time but that if you are sitting like this, On the way to work, I do lots of SharePoint & non SharePoint readings & more like blogging, answering forums, preparing my powerpoints for my next sessions, that gave me time to do a lot.